Clean the house, get organized, eat healthy and get in shape … we can't help you much with the first few, but we can steer you toward the best sales on fitness equipment. What you do with it after that is up to you — store it in the garage or use it — either way you'll immediately feel better if you don't pay full price. 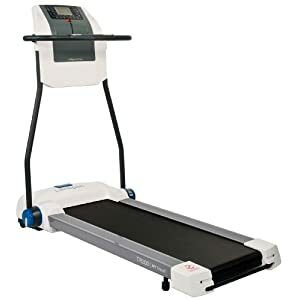 Save 20% on the LifeSpan Fitness Fold-N-Stor Compact Treadmill, model no. TR200, for $599.99 at Amazon. Free shipping is offered, and it has the lowest total price we could find by $100. It has a blue LCD console that tracks time, calories, distance, steps, speed and incline. Another terrific treadmill deal is the Gold's Gym GG480 Treadmill, model no. GGTL39608, for $377 with free shipping at WorkoutWarehouse.com. It is discounted $122 and is the lowest price we could find. It has a 10 mph maximum speed and 10% maximum incline, can manage up to 300 pounds and has a heart rate monitor and padded running surface. There are all kinds of video fitness games for the Nintendo Wii, Xbox and other gaming systems, but if you were lucky enough to get the Xbox Kinect for Christmas and like to dance, then the Zumba Fitness for Xbox 360 is what you want. It costs just $28.49 with free shipping at Amazon.com, making it the lowest total price we could find for the workout disc by $13. You had to do them in high school gym class and hated having to do them in front of your friends, now keep the humiliation private by doing pull-ups at home with the Perfect Pullup. Toy Ranch sells it on Am for $17.29, with $5.58 more in shipping (although shipping is free for orders of $25 or more, so you might as well buy a diet book, too). Most stores charge $35 or more for this item, which has adjustable swing arms for three exercise positions and rotating handles. It can fit in door frames from 27 to 36 inches wide for users up to 300 pounds. Will you get abs like the guy in the promo photo? It may take a while, but if you add some leg raises and keep your spirits … up, you just may get those washboard abs. For the truly lazy, a one-year subscription (10 issues) of Fitness Magazine for $2.99 with the coupon code "FITNESS" is available at Tanga.com. A subscription is regularly $19.99 and this deal is $3 less than the lowest price we could find. Hopefully reading the magazine will inspire you more to work out than we have. If treadmills aren't your thing, the Pursuit E 25 AirResistance Bike Exercise Bike at Amazon.com is $89.99, which includes free shipping. Be sure to get model no. WLEX0996. Aaron Crowe is a freelance journalist in the San Francisco Bay Area. He has worked as a reporter and and editor at newspapers and websites. Follow him on Twitter — @AaronCrowe.